Is é an rud is ábhar don leathanach seo ná an stát. Más suim leat ciall eile an téarma seo, léigh Nua-Eabhrac. Ceann de na 50 stát de chuid Stát Aontaithe Mheiriceá is ea Nua-Eabhrac. Is é Albany príomhchathair an stáit agus is í Cathair Nua-Eabhrac an chathair is mó agus is aitheanta ann. Úsáidtear an giorrúchán NY don phost. Tá Stát Nua-Eabhrac suite ar chósta an Aigéin Atlantaigh in oirthuaisceart na Stát Aontaithe. Tá Nua-Eabhrac ag críochantacht le Ceanada ó thuaidh, le Vermont, Massachusetts, agus Connecticut thoir, agus le New Jersey agus Pennsylvania ó dheas. Chuir daoine fúthu san áit ina bhfuil Stát Nua-Eabhrac anois timpeall 10,000 bliain ó shin. Treibheanna Algancacha a bhí i ndeisceart agus oirthear an stáit le fada an lá faoin am ar tháinig na chéad Eorpaigh. Bhí an pobal Lenape sa deisceart agus i ngleann an Hudson suas leath an bhealaigh go hAlbany, a bheagán nó a mhórán; agus bhí na Mahican ní b'fhaide thoir thuaidh. Tháinig na hIroquois aneas as na sléibhte Apaláiseacha timpeall na bliana 800 agus chuir siadsan fúthu in iarthar agus i dtuaisceart Nua-Eabhrac. Cónaidhm de chúig threibh a bhí ann, mar atá (agus ag dul ó oirthuaisceart Nua-Eabhrac siar) na Móhácaigh, Oneida, Onondaga, Cayuga agus Seneca. Chónaíodh na Móhácaigh taobh thuaidh de na Lenape. I ndiaidh teacht na nEorpach, thréig na Tuscarora, treibh Iroquois eile, a ndúiche i Carolina Thuaidh agus chuir siad fúthu i Nua-Eabhrac mar an séú treibh den chónaidhm. Thaiscéalaigh roinnt Eorpach an cósta Atlantach, agus ar 11 Meán Fómhair na bliana 1609 rinne Henry Hudson, Sasanach i seirbhís na hÍsiltíre, a bhealach isteach i mBá uachtair Nua-Eabhrac. Cé go ndeachaigh na Francaigh isteach i dtuaisceart Nua-Eabhrac ar mhaitheas taiscéalaíochta, fionnadh agus iompó na nIndiach ina gCaitliceach, ba iad na Dúitsigh na chéad Eorpaigh a chur fúthu sa stát, ag Fort Orangie ar shuíomh Albany an lae inniu, sa bhliain 1624. Ba iadsan freisin a chuir cathair Nieuw Amsterdam ("Amstardam nua") ar bun sa bhliain 1625, agus de réir an scéil choitinn, cheannaigh Peter Minuit oileán Manhattan ó na hIndiaigh ar bheagán áilleagán arbh fhiú $24 iad. Athdhéanamh ar an Halve Maen ("Leath ghealaí") ar a bealach thar íochtar Manhattan, mar a rinne an Halve Maen faoi stiúradh Henry Hudson sa bhliain 1609. Ó 1609 go 1701 bhí Cogaidh na mBéabhar ar bun, coimhlint a tháinig as an comórtas idir na dtreibheanna ar son an bhuntáiste i dtrádáil na bhfionnadh leis na hEorpaigh. Bhí an bua ag na hIroquois ar na treibheanna ar gach taobh díobh. Bhí ar na hIroquois géilleadh roimh na Francaigh i lár an 17ú haois ach d'éirigh eatarthu an athuair. Shínigh ceannairí na nIroquois an conradh ar a báisteadh Síochán Mór Mhontréal sa bhliain 1701, rud a chuir críoch leis an gcogaíocht eatarthu ar choinníollacha i bhfábhar na nIroquois. Bhí na Sasanaigh ag dul i neart sa réigiúin faoin am sin agus chonacthas do na hIroquois go mbeadh an lámh in uachtar acu féin ach an dá ghrúpa Eorpach a chur in éadan a chéile. Roimhe sin siar sa bhliain 1664, ghéill pobal Nieuw Amsterdam do fhórsa armtha Sasanach. B'shin deireadh le smacht na nDúitseach ar an gcoilíneacht ar fad, ó Delaware go dtí na bólaí taobh thuaidh de Fort Orangie. Thug na Sasanaigh "New York" ar limistéir an stáit mar atá sé inniu, é sin in ómós do Dhiúic Eabhrac i Sasana. Is de bhunús Cheilteach an ainm Eabhrac. Bhí Nua-Eabhrac ina phríomhchathair i Stáit Aontaithe Mheiriceá (S.A.M.) ar feadh aistir ghearr i ndiaidh Chogadh na Saoirse. Bhí an sclábhaíocht coitianta faoi na Dúitsigh agus na Sasanaigh araon i gCathair Nua-Eabhrac agus ina lán ceantracha faoin tuath. Cuireadh deireadh leis an sclábhaíocht de réir a chéile i ndiaidh Chogadh na Saoirse agus saoradh an duine deireanach díobh sa bhliain 1827. Sa bhliain 1917 tugadh cearta vótála do na mná den chéad uair. Ar 11 Meán Fómhair 2001, fuair breis is 2,600 duine bás ag an Ionad Trádála Domhanda i Manhattan, an t-ionsaí sceimhlitheoireachta is mó i stair na Stát Aontaithe. I 2011 thug Tionól Reachtais an stáit cead do shaoránaigh an stáit duine den inscne chéanna a phósadh. 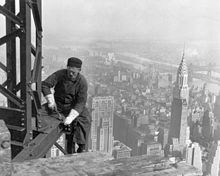 Fear ag obair ar an Empire State Building i 1930. Fostaíodh a lán Móhácach agus cuid daoine as Talamh an Éisc in obair thógála i gCathair Nua-Eabhrac i lár an 20ú haois. Tá sléibhte na nAdirondack i dtuaisceart an stáit, agus cinn níos ísle ná iad, na Catskills, siar ó dheas as Albany i lár an stáit. Ritheann abhainn mhór an Hudson ó limistéir theorainn Cheanada go cathair Nua-Eabhrac, agus seolann longa móra uirthi go dtí Albany. Ba é tógail an Chanáil Erie, go deimhin, a chur bun leis an dtús áite a bhí le fada ag cathair Nua-Eabhrac i gcúrsaí tráchtála. Bhí bealach sa chanáil le táirgeadh de chuid mhór den tír a thabhairt ar uisce go dtí an cósta roimh aimsir na dtraenach. Ba US$1.16 trilliún an olltáirgeacht instáit ag Stát Nua-Eabhrac sa bhliain 2010, rud a chuir an stát sa tríú háit sna Stáit Aontaithe, i ndiaidh California agus Texas. Tá níos mó ceanncheathrúna institiúidí airgeadais suite i gCathair Nua-Eabhrac ná in aon chathair eile sna Stáit Aontaithe. Fostaítear líon mór daoine sna bainceanna, comhlachtaí árachais, tithe bróicéireachta, agus stocmhalartáin sa chathair sin, go mór mór i gCeantar an Airgeadais i ndeisceart Manhattan. Is sa cheantar sin a bhfuil Stocmhalartán Nua-Eabhrac agus an Stocmhalartán Meiriceánach suite. I measc tionscal an stáit, tá foilsitheoireacht agus clóbhualadh, innealra agus feisteas tionsclaíoch, innealra leictreonach, turasóireacht, agus feirmeoireacht. Meastar ar an seachtú háit é le táirgeadh tionscail. Tógtar eallach agus éanlaith clóis, agus fástar glasraí, torthaí agus min. Tá tábhacht, leis, le fás caora fíniúna agus déanamh fíona ar an Oileán Fada, i ngleann an Hudson agus in iarthar an stáit. Bhí daonra 8,008,278 i gcathair Nua-Eabhrac sa bhliain 2000, rud a thugann tus áite di i measc chathracha na Stát Aontaithe. Ba í cathair Nua-Eabhrac longphort iontrála an-chuid d'imircigh na hEorpa go dtí S.A.M. Ba é Oileán an Choraintín sa chalafort stáisiún iontrála na loingeas paisinéara ón naoú haois déag go tús an fichiú haois. Roimhe sin, thigidís i dtír ar dheisceart Manhattan, in áit ar a dtugtar an Battery. Fós féin, tá pobail éagsúla le feiceáil ar fud na cathrach. Sa lá atá inniu ann, tagann a lán imirceach ar tír in Aerfort John F. Kennedy i Queens, nó in Aerfort Newark, i New Jersey, atá suite i gcóngar 35km ón gcathair. Síneann An tOileán Fada amach soir as cathair Nua-Eabhrac. Tá sé os cionn 170 km ar fhaid, ach níl sé mórán thar 30 km ar leithead in aon chuid de. De ghnáth nuair a luaitear an ainm, fágtar Queens agus Brooklyn ar lár, mar go bhfuilid i gcathair Nua-Eabhrac, cé gur chuid den oileán iadsan maidir le tíreolaíocht. I measc chathracha móra eile an stáit, áirítear Buffalo (d. 292,648), Syracuse (d. 147,306), Yonkers (d. 196,086), agus Rochester (d. 219,773). Tugtar go minic "Upstate" ar an gcuid den stát a luíonn ó thuaidh ó chathair Nua-Eabhrac agus ón Oileán Fada, .i. mórchuid an stáit. "Downstate" a thugtar ar chathair Nua-Eabhrac agus an Oileán Fada. Loch Keuka, ceann de na Méarlocha in "Upstate New York"
Tugadh an leathanach seo cothrom le dáta an 23 Nollaig 2017 ag 20:09.